Jordan executes two Iraqi militants in response to ISIS’ execution of pilot. 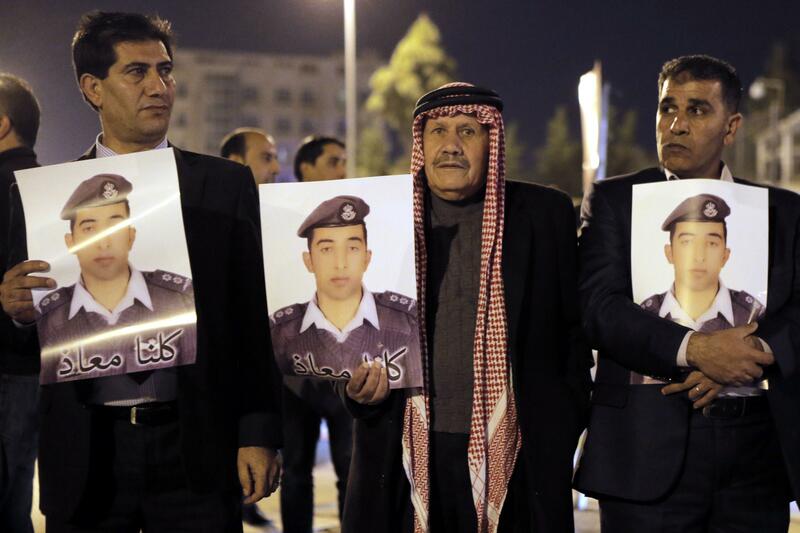 Relatives of Jordanian air force pilot during a protest near the Prime Minister office in Amman. Jordan vowed bloody retribution for ISIS’ brutal killing of Jordanian pilot Lt. Muath al-Kaseasbeh, and on Tuesday it killed two people—a jailed Iraqi woman and an Iraqi Al-Qaida operative—in response to the ISIS killing. Jordan had been trying to negotiate with ISIS to secure al-Kaseasbeh’s release. The Jordanian government was even willing to release Sajida al-Rishawi, an Iraqi woman militant, who was sentenced to death for her role in a 2005 suicide bombing in Amman that killed 60 people. A video of al-Kaseasbeh being burned alive was released on Tuesday just over a month after he was taken prisoner during a failed air strike in Syria. Jordan promptly executed al-Rishawi after the video of al-Kaseasbeh’s death surfaced. “Ziyad Karboli, an Iraqi al Qaeda operative, who was convicted in 2008 for killing a Jordanian, was also executed at dawn,” Reuters reports.